retraction engine nears the end of the retract stroke, the retract dump valve is actuated. The dump valve closes allowing the pilot-actuating fluid from the retract directional valve to return to the gravity tank, initiating the retract braking stroke. VENT VALVE PANEL The vent valve panel is located on top of the retraction engine manifold assembly. Vent valves are mounted on the panel and are connected to various points in the retraction engine hydraulic system. These valves are used to bleed (vent) air and air saturated hydraulic fluid from various retraction engine components. A hydraulic fluid reservoir is located at the bottom of the vent valve panel. The reservoir is used to collect vented fluid and provide the outlet to return vented fluid to the hydraulic system. CABLE TENSIONER ASSEMBLY The cable tensioner assembly (fig. 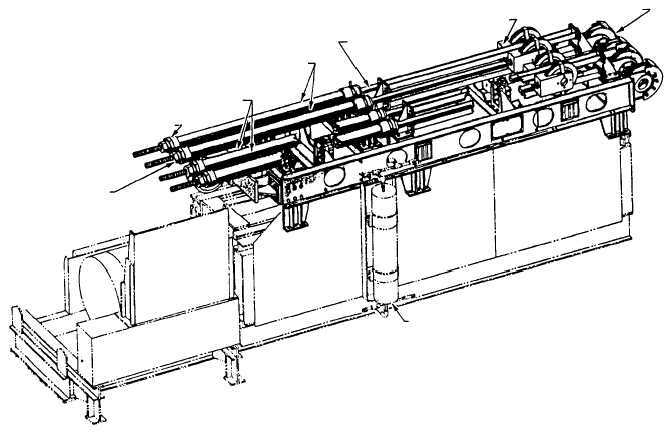 4-47) consists of the four cable tensioners required to keep the retraction engine drive system taut. Each cable tensioners consists of a hydraulic cylinder containing a piston with a threaded rod extending from one end and a rod attaching a clevis/sheave from the other end. Fluid under pressure from the cable tensioner accumulator forces the tensioner sheaves toward the cylinders applying tension to the drive system cables. The threaded rods with adjusting nut on the other end of each tensioner provide a stop for sheave stroke when the pressure in the tensioner cylinders is overcome by the braking action which occurs during dump valve actuation. 4-39 PISTON ROD CLEVIS ASSEMBLY SHEAVE ASSEMBLY RETRACT CYLINDER ASSEMBLY ADVANCE CYLINDER ASSEMBLY STOP NUT LOCKING NUT TENSIONER ACCUMULATOR (REF) ABEf0448 Figure 4-47.Retraction-engine cable tensioners.